The “Congressional” Natural Born Citizen Part II: Shocked, Outraged or Ambivalent? And what if ALL these prior efforts were retroactive to ALL children born, that are alive today in the US and abroad. Of all these permanently recorded Congressional proposals, the ones that give us more in-depth testimony/summary are H.R. 1380, H.J. Res. 88, S. 2128, S. 1348 & S. 2678. Kennedy’s aka ‘Fast Eddie’s’ bill, S. 1348, went a bit further and it was quite clever of him to slip those 2 little yet powerful words ‘natural born’ into the bill. Reading the summary was quite laughable. This is where Kennedy tries to claim that children(anchor babies) born to nonimmigrant illegal aliens are ‘natural born’, however he does not stop there, he goes on to call adopted children of nonimmigrant illegal aliens as natural born once the aliens acquired the new Z-visa that would have been created by the immigration reform act. In 2000, Rep. Barney, I can’t “Frank”ly understand why Ma. keeps reelecting him, introduced H.J. Res. 88, an amendment to the Constitution of the United States to make eligible for Office of the President a person who has been a citizen for twenty years. This is the 1st bill introduced where we have extensive testimony on the subject of ‘natural born citizen’ before the Subcommittee of the Constitution because Barney does [n]ot favor putting obstacles on the ability of the people to choose who they wish] to elect. And Mr. Candy is quite right. The qualification was put in place specifically for national security & sovereignty reasons. It was put in place to protect the citizens of the newly formed Republic from ever becoming ‘subjects’ to foreign sovereigns or an all powerful central Monarchy. Mr. Candy has done his homework and thus is the reason I believe that this never made it out of committee. However, let’s review a bit more testimony. We shall start with the testimony from an immigrant, Balint Vazsonyi, of the Center for American Founding who immigrated in 1959. Of course the committee heard from 2 other witnesses for the progressive view; one for adoptive parents of foreign children and the other a civil rights activist for immigrants. You are welcome to read their bloviating testimony online as it is not relevant to defining ‘natural born’. After H.J. Res. 88 failed to make it out of committee, Sen. Nickles (OK) along with Landrieu (LA) and Inhofe (OK) brought forward S. 2128 in 2004, a bill to define the term ‘natural born Citizen’ as used in the Constitution of the United States to establish eligibility for the Office of President. “There is obviously a need for clarification. In the absence of a judicial interpretation, Congress can express a legislative interpretation of Constitutional terms. We should not wait for an election to be challenged and the courts to decide what ‘natural born’ means. Sen. Inhofe made note of the repealed Immigration & Naturalization Act of 1790 as some sort of fact that Congress had defined what ‘natural born’ meant, as if it has always pertained to naturalized citizens or citizens by statute, and uses the argument that in the absence of any judicial interpretation, Congress, per the 1790 Act, has the authority to make such interpretation. And let it be noted, Inhofe per his speech, is the grandfather of an internationally adopted child, thus did not have pure intentions when signing onto this bill. There was no objection, the bill was recorded and met the same demise of all previous other attempts to alter presidential qualifications. Part III: the conclusion. I purposely held back the review & summary of S. 2678 as it pertains directly to S. Res. 511 and including it here would spill the beans so to speak. But rest assured, it will be published no later than Thursday evening. Leo, this ones for you. “Thank You” for your dedication that lit a fire underneath me while educating me at the same time. I give you my final research to judge for yourself. Parts I & II with all the Congressional actions to eliminate ‘natural born’ from Article II, Sec I Clause V of the Cosntitution from 1973 forward can be found here. This is not a new concept in DC, yet it would seem these days that it has become the norm. Sometimes it works, sometimes it doesn’t as in the case of S. 2678, a bill [To clarify the law and ensure that children born to United States citizens while serving overseas in the military are eligible to become president]. The bill was sponsored by Sen. McCaskill (MO) and introduced in the Senate on February 28, 2008. After having been read twice, the bill was then referred the Judiciary committee. On February 29thSen. Obama (IL) signed on as a co-sponsor and then on March 3rdSen. Menendez (NJ) & Sen. Clinton (NY) were added as co-sponsors to the bill. By March 4thSen. McCaskill & team had recruited a Republican, Sen. Coburn (OK) to join the ticket to usurp the constitution. So if we take McCaskill’s words ‘shall include’ and the singular use of ‘citizen’ we can conclude that Congress was aware of the Congressional history of the term ‘natural born’ and was looking for an out for McCain. But Obama, seizing his opportunity to ride the wave, rushed right over to McCaskill’s office and requested to be assigned as a co-sponsor of the legislation the very next day. Or was McCaskill the ‘fall gal’ all along? Did Obama & the Democratic elite know ahead of time of Obama’s ineligibility problem and used McCaskill or did she sign on to the corruption of her own volition? This we may never know. Beginning sometime in 2007, the blogosphere was a buzz with a former Washington Post article from 1998 titled “McCain’s Panama Problem’ that had resurfaced and the search into the Panama Canal history took off at rocket speed. Questions regarding McCain’s eligibility continued to plague McCain & the RNC. The public announcement of S. 2678 on February 28, 2008 was like pouring gasoline onto an already burning fire. A quick search of Internet archives shows that the issue was quite a ‘hot’ topic however I was not paying too much attention to it at the time which I will forever regret. But someone else was paying very close attention. A certain someone, who has remained very close to Obama since his years at Harvard, was quietly working the backrooms of college campuses for the Obama campaign. On September 17, 2007 the Chicago Tribune publishes an extensive list of Obama’s Policy team and listed under domestic policy is ‘Laurence Tribe (Harvard Law Professor). Then on November 19, 2007 MSNBC reports that the first Obama campaign mailing had been sent out to NH voters and inside the mailer is a quote from Tribe. In addition to the endorsement in the campaign mailers, Tribe spent quite a bit of time that November touring New Hampshire campaigning for Obama. Moving on into December of 2007, Tribe’s former endorsement is officially listed at Obama’s my.barackobama.com by Eddie Lee, Obama Staff. For some readers, this is where you may want to switch from coffee to a stiffer drink. This pretty much wraps it up for me as to why Obama signed onto S. 2678 so quickly and why the wheels shifted so swiftly from S. 2678 to S. Res. 511. With Tribe already on Obama’s policy team, you can bank on the fact that discussions were already had that S. 2678 would have to be resubmitted as an amendment to the constitution, however there was a much swifter and less ovbious way to proceed that would sanitize Obama’s eligibility problem through McCain. With the help of the 2 most prominent/influential constitutional lawyers known to the DC circuit, they would use a non-binding, but publically accepted backdoor method called a Resolution. Already laying out the background on Laurence Tribe, we must now look at Theodore Olson. Olson was born in Chicago; however he grew up in the same liberal stomping grounds of the San Francisco valley as Tribe. He received his law degree at Berkley in 1958 & is a member of The Federalist Society. While serving under Reagan & Bush Jr., Olson championed conservative & constitutional causes, though his actions out of public office lean more to the liberal progressive causes. After retiring from Solicitor General in 2004, Olson returned to Gibson, Dunn & Crutcher at their DC office. Olson had previously worked for Gibson Dunn in Los Angeles (beginning in 1965) as an associate where he eventually made partner. Soon after the 2008 elections, Olson jumps the conservative ship & joins David Boies, (lead council for Gore in Bush v. Gore & an invited guest to Olson’s nuptials to Booth in Napa Valley, Ca in 2006) in Boies’s lawsuit to overturn Prop 8 in California. Thus the question begs to be answered, why would a member of the Federalist Society, co-write an analysis that is in complete conflict to what the Federalist Society’s review of natural born citizen is? Is his membership for decoration purposes only? Maybe, however I believe Olson finally released his inner ‘liberal civil rights activist’ that has been pent up for decades. Note must also be taken that Olson’s wife, Lady Booth is very active in the liberal activist realm & was a staunch supporter of Obama during the 2008 campaign. Thanks to commenter ‘royll’ for bringing this to my attention. As I stated earlier, the change from S. 2678 to S. Res. 511, a resolution [R]ecognizing that John Sidney McCain, III, is a natural born citizen] moved curiously swiftly. I will also not go into all the ‘whereas’, as I have already covered this. You can read them here, along with my commentary. What I will do is pick a couple of them apart that pertain to Olson & Tribe’s analysis, as well as the testimony/analysis of Olson & Tribe. I will also place special emphasis on Tribe who is on record as officially endorsing Obama as well as a current member of Obama’s domestic policy team well before S. Res. 511 was introduced. I do believe Olson’s part, for the most part, was pure decoration for the benefit of the GOP to get them to go along with the scheme. I’ll let you judge for yourself by reading this article from the ‘World Socialist Website’. There could be no better cover-up, than to put a so called conservative constitutional lawyer who is loathed by the liberal left, but also happens to be a closet liberal civil rights activist in bed with a progressive one. First let’s begin with the written analysis/testimony that was permanently recorded in the congressional record on April 30, 2008 but was officially sent to the Senate on April 8ththrough the law firm of Gibson, Dunn & Crutcher LLP. And there we have it, that big ‘it’s my constitutional right to be president some day’ analogy thrown right in our faces. Framers be damned! So now that we have an initial grasp of the view of the Constitution these two men hold, let’s look further into their true interpretation of who they believed the Framers to be. You know, those men who were our founding fathers and who also fought a bloody war. A war to end America’s ties to an all powerful Monarchy and put in the hands of the people, the power to govern themselves by drafting a Constitution & establishing a Republic. Tribe & Olson go on to mis-cite the specific part of Wong Kim Ark they are relying on for their conclusion, and they also do not cite the case Minor v. Happersett (1874) 21 Wall. 162, 166-168 which we know for a fact, from extensive research done by Leo Donofrio & team, was the guiding case for the Wong Kim Ark decision. Look at that, you have Justice Gray citing the court in Minor who are themselves citing the “Laws of Nations” definition (they didn’t directly cite that treatise but the definition used is taken therefrom) of natural born citizen = person born in US to “citizen parents” = nbc . Now, why, would the Supreme Court be relying on the Law of Nations if in fact, as Tribe & Olson claim, the Framers relied on English common law. The same law that kept them oppressed while under the rule of the English Monarchy. The fact is they didn’t. In the 1st commentaries on the Constitution written by Supreme Court Justice Wilson (who was appointed by George Washington, was a signer of the Declaration of Independence and was as member of the Continental Congress), Wilson specifically refers to the law of nations as the guiding force behind our Constitution and it interpretation. Clear, concise & truthfully spoken. This is also one of the most inspirational commentaries on our Constitutional law & patriotism I have read. If you have not read James Wilson, Of the Law of Nations, Lectures on Law (1791) as of yet, I encourage you to do so. For supposed constitutional scholars, Tribe & Olson really miss the mark on this one. They also make reference that we are a democracy which is just an out right lie. The Framers wrote a Constitution for a Republic with citizens as sovereigns who are superior to the government institution itself, not Subjects to some Democracy who are ruled by a central government put in place by mob rule and where individual rights are only those given to you by the government. Democracies rarely last, they either give cause for revolution or they ascend to a Monarchy or Dictatorship. In a recent Illinois Public Law & Legal Theory written by Professor Lawrence B Solum of the U of IL, College of Law, Chicago, Solum further explains why the English common law definition of ‘natural born subject was not the definition adopted by the Framers for the Sovereign citizens of the United States of America. [Blackstone Commentaries (1765): When I say, that an alien is one who is born out of the king’s dominions, or allegiance, this also must be understood with some restrictions. The common law indeed stood absolutely so; with only a very few exceptions: so that a particular act of parliament became necessary after the restoration, for the naturalization of children of his majesty’s English subjects, born in foreign countries during the late troubles. And this maxim of the law proceeded upon a general principle, that every man owes natural allegiance where he is born, and cannot owe two such allegiances, or serve two masters, at once. Yet the children of the king’s ambassadors born abroad were always held to be natural subjects: for as the father, though in a foreign country, owes not even a local allegiance to the prince to whom he is sent; so, with regard to the son also, he was held (by a kind of postliminium) to be born under the king of England’s allegiance, represented by his father, the ambassador. [Solum: If the American conception of “natural born citizen” were equivalent to the English notion of a “natural born subject,” then it could be argued that only persons born on American soil to American parents would have qualified. This might lead to the conclusion that McCain would not be a constitutional natural-born citizen, because the Panama Canal Zone was not the sovereign territory of the United States, but was instead merely subject to its administrative control. The language of the Constitution recognizes a distinction between the terms “citizen” and “subject.”For example, in Article III Section 2, which confers “judicial power” on the federal courts, “citizens” of the several states are differentiated from “citizens” or “subjects” of foreign states—corresponding to the distinction between diversity and alienage jurisdiction. In the framing era, these two terms reflected two distinct theories of the relationship between individual members of a political community and the state. In feudal or monarchical constitutional theory, individuals were the subjects of a monarch or sovereign, but the republican constitutional theory of the revolutionary and post revolutionary period conceived of the individual as a citizen and assigned sovereignty to the people. As you can see, in England there are two very distinct meanings of ‘natural born’ subject. In one hand there is the broader view & in the other there is the view of the laws of nations. What the liberal progressive constitutionalists use is the broader view and thus disregard the fact that at some point, even England used the law of nations. The Framers also knew of Englands use of the law of nations and were very aware of its importance when establishing a new nation. It has also been proven that the Law of Nations was in the hands of the Framers at the time of the drafting of the Declaration of Independence. To believe that the Framers held onto this logic and thus held onto the common law definition of subjects for the newly emancipated citizens, would be to believe there was never a bloody revolution to escape it. The truth is Blackstone was a Kings Knight. He loved his dear England and was faithful to the end and to the Monarchy who he adored just as much. Blackstone was also noted for contradicting himself, which I believe is the reason for such confusion in interpreting his commentaries. Moving on to the real truth of which law guided the Framers, we turn to another early Supreme Court Justice, Joseph Story, who was also the main founder of Harvard law School. Story gives a very distinct conclusion to the Law of Nation & the law of nature as the guiding force behind the Framers definition of ‘natural born’ citizen when he wrote this of the qualifications for President in one of his early commentaries. Story specifically calls the founding fathers ‘naturalized’ citizens, and rightly so. Tribe & Olson’s analysis is all over the place. They bring in the repealed Naturalization Act of 1790 and in light of Wilson’s 1st ‘Commentary on the Constitution’; we can put to rest the reason as to why that Act was repealed. Congress was not invested with the powers of declaring anyone a ‘natural born’ citizen. The only powers regarding citizenship they had were those of naturalizing alien immigrants. A ‘natural born’ citizen is clearly defined in the laws of nations as well as the Congressional records of 1866. Tribe & Olson also refer to several statutes pertaining to citizenship, however, the Constitution trumps statutes, thus using them to define ‘natural born’ citizen is grossly incompetent in light of all the historical and legal references that date back to the revolution. Leo Donofrio gives an excellent run down of how McCain is a citizen by statute and according the most current version of the US Foreign Affairs Manual, it has yet to be determined whether children born abroad are eligible for President. “According to the birth certificate and COLB of John McCain, McCain was born in Colon Hospital, city of Colon, Panama. 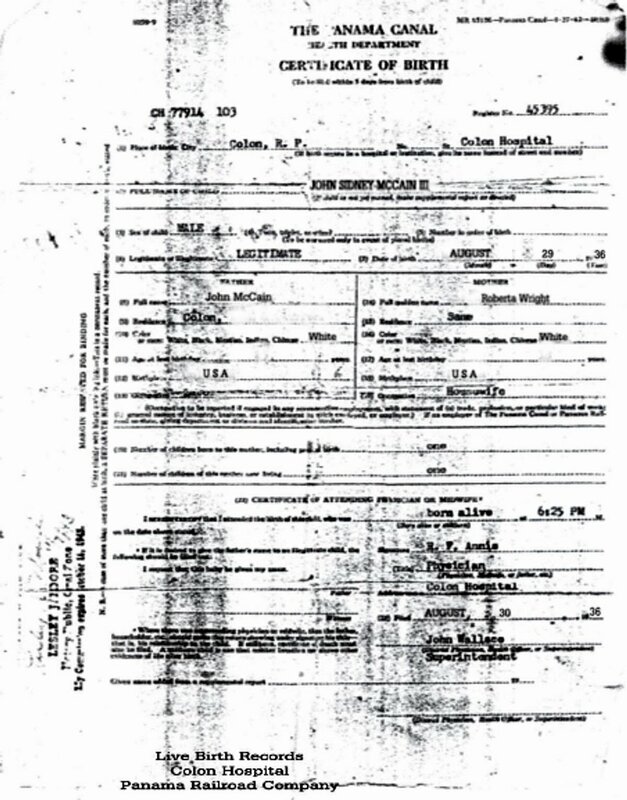 While the BC states at the top that it is from the “Canal Zone”, the document also states that McCain was born in Colon Hospital, city of Colon. The city of Colon and the hospital were not in the Canal Zone. The common story you hear is that McCain was born in the Canal Zone, but these documents posted online do not testify to that. Furthermore, there is no official document that has ever surfaced which states that McCain was born in the Canal Zone. Permit me to dispel that Panama newspaper birth bit, Leo. It would seem that there is NO record of John McCain in the August 1936 birth registry of the Canal Zone. Nope, no index record there, but I’ll bet you can find it in the August birth registry of the Republic of Panama since McCain was actually born off base in Colon Hospital, Colon, Panama. The media propaganda machine also covered for McCain by claiming that it was a clerical mistake that McCain is not listed in the August 1936 Canal Zone index registry. And as if that wasn’t enough, they tried to claim a different doctor than the one that signed the birth certificate, actually delivered McCain. Thanks to the lame stream propaganda media who stepped right up and said the visible, certified official records are wrong, the general public was kept in the dark as to the truth. This also goes to show that it doesn’t matter how decorated you are and how many years your family has served honorably, eventually those who spend too much time in politics will fall to the intrigue and corruption of power. So what does this all have to do with Obama? Olson & Tribe conclude their analysis by reiterating their delusional rhetoric and false reporting of Kansas & Arizona as just territories. Kansas & Arizona were Sovereign Territories that had been operating under the complete law of the U. S. Constitution and jurisdiction of the United States and thus their citizens were under complete jurisdiction of the Constitution of the United States and were considered for all legal and political purposes to be the same as that of statehood citizens. Olson & Tribe consistently refer back to the 14th Amendment & its interpretation that a citizen born to an immigrant is none the less a citizen and therefore under English common law, the founders considered them to be same as a ‘natural born’ citizen in all sense of the words. They did this purposely to confuse the issue knowing that Congress never really reads anything, anyways. However, I think I can confidently claim that I, along with the help of some great patriots out there, have blown that smoke filled theory right back where it came from…right up the ‘you know what’ of the liberal progressive ideologues who believe we are Subjects to some all powerful central government. We are NOT Subjects, Nothing could be further from the TRUTH and the TRUTH ALWAYS PREVAILS! Then put Theodore Olson next to Tribe in a Senate Judiciary hearing and what you have is the ultimate ‘white-wash’ of political corruption. Also BUSTED by McCain’s own original vital records and the index birth records kept by the Canal Zone. Was it a coincidence that Obama quickly signed onto S. 2678? I think NOT! Was it also a coincidence that Tribe gave that political persuasive talk on Jan. 31, 2008? I think NOT! And it certainly was no coincidence that Tribe was selected to co-write the analysis that would sanitize McCain & Obama’s ineligibility. After all, persuasive speeches seem to be his forte’. You had just better make sure you are wearing pretty high boots if you ever attend one. And as if all this is not enough to prove that our government and our election process is totally corrupt to the core, Roger Calero, a green card holding alien from Nicaragua and member of the Socialist Workers Party (communist party) was on the Presidential ballots in 5 states where he received 7,209 votes. He originally was on the ballot in 12, however was removed from 7 and replaced by another SWP member James Harris who received 2,424 votes. The states that allowed Calero, a Nicaraguan National, to remain on the ballot despite complaints to the Secretary of State in those states prior to the election were: CT, DE, MN, NJ, NY & VT. There are 535 members of Congress who know the truth. Will they step up to the Constitution and hold themselves accountable by returning the election to the people so that we may have a legitimate presidential election in which we have eligible candidates to vote for? I’m not holding my breath for that to happen because I do not think there is a true Patriotic spine in the lot. What I will do is make a guarantee to keep researching and expose every speck of corruption I dig up. God Bless America and God Bless Our Brave Service men & women who serve honorably and are NOT afraid to uphold their oath of office and defend this great nation from enemies foreign & DOMESTIC.